STPeach is not a new name on social media as many people recognize her on the online gaming platform Twitch. The lady star whose real name is Lisa Peachy began streaming in 2015 and since then possesses a massive fan following. Many might feel heartbroken to hear that the gorgeous lady is already taken. She is enjoying a smooth and sound relationship with her lover. If you want to know more about that, we've covered all that you need to know about STPeach's love life and how is it going on. Who is Twitch Star STPeach's Boyfriend and Past Relationship? STPeach is savoring a happy love life for a good number of years now. Her boyfriend is a guy named Jay who is a Korean nationality. The couple first got to know each other through online gaming in 2011. At that time love did not sprout between the two and they were just friends. Back then, they were in their own respective relationships. It was only in late 2016 when they met face to face for the first time at an airport in California. The meeting marked the beginning of romantic love between two people of different culture and background. Jay was an excellent match for the Instagram star since she liked Asian guys as she had many Asian friends while growing up. As for their relationship status, the pair are going stronger than ever. Don't Miss: Who is 24 Years Canadian Twitch Streamer Shroud's Girlfriend? Know About His Affairs and Dating rumors! As a matter of fact, Peach and Jay are now engaged to get married very soon. The fitness model announced the good news via her Instagram on May 22, 2018. Well, congratulations from us beforehand for the couple! STPeach with her boyfriend Jay. "Happy Birthday to the love of my life, my future hubby, I'm so happy you were born, I love you"
Well, we probably don't have to give any more proof on how much StPeach adores and loves her partner. Although many people were happy for STPeach and her lover Jay, the same cannot be said about everyone. The duo faced waves of verbal abuse on the Internet for their relationship. Many of Vlogger's male fan followers wrote bad and mean comments to them. You May Also Like: American YouTuber Asmongold Dating a Girlfriend? Know About His Affairs and Rumors! Especially Jay faced racial abuse because of his Asian background. 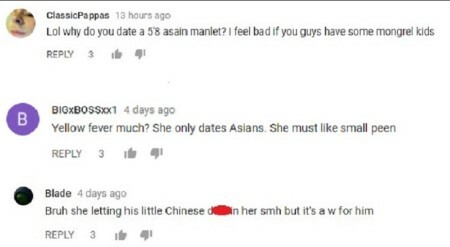 He was called “Asian manlet,” “gook,” “homo,” “Chinese” and "motherf**ker", while his girlfriend “yellow fever” and even called a “race traitor,”. Racial comments against STPeach and her boyfriend Jay. The online gamer even spoke on behalf of her lover and defended him from the people's abuse. She tweeted on her Twitter account on February 02, 2019. The charming lady also told that such abusive and racial comments don't really affect their relationship and in fact, keeps their bond even stronger. "We are both happy with one another. The hate doesn’t affect us or our relationship together. To be honest, we find it funny that it’s even a topic of discussion because it just seems like such a normal thing to us." Also Read: The League of Legends Personality Xchocobars' Dating A Boyfriend Named Jeremy Wang? Her Affairs and Dating Rumors! We praise the couple for standing together while so many are against them. Additionally, we do hope the day is not very far when the couple walks down the aisle. STPeach was born as Lisa Vannatta on November 08, 1993, in Canada. She grew up with her two older brothers in Canada. The charming lady holds Canadian nationality and belongs to a white ethnical background. Lisa began streaming on Twitch on August 25, 2015, where she has more than 800,000 followers. She is active on other social media platforms like Facebook, Twitter, and Instagram where she boasts 19K, 186K, and 1.2 million followers respectively. Vannatta stands at a height of 5 feet 5 inches. She is worth an estimated $200 Thousand, as of 2019.